I am solidly in the middle of a number of books at the moment and approaching the end on a few others. I was beginning to feel a bit desperate because here we are halfway through January already and I haven’t finished a single book. Then several comics I had been waiting for arrived from the library and I can feel happy about having finished something! First up, Monstress, Volume One. I have been waiting to read this one since September. The wait was worth it! The art is gorgeous. And the story, well, it is hard to follow at first because Liu makes you figure it out. Eventually she takes pity and helps fill in some of the details with parts of a lecture from a professor cat. Heh, yup, the cats talk and are smart and generally have more than one tail. The story follows Maika Halfwolf. She is a survivor of a war between the humans and the Arcanics. Maika is Arcanic and Arcanics are not human. There is an uneasy truce between the two races who live separated by a wall, but the witch-nuns known as the Cumea, kidnap Arcanics and use their life force to heal themselves and prolong their lives well past the natural human lifespan. Maika is out for revenge and in the process, she discovers she has a demon inside of her. Next is Paper Girls, Volume One by Brian K. Vaughan of Saga fame. It’s Halloween, 1988, and unusual for girls to have jobs delivering papers. The wee hours after Halloween is a dangerous time to be out because bullies. So the four girls team up to help each other deliver the papers. But this turns out to be no normal Halloween. Monsters and time travelers and strange disappearances, oh my! These twelve-year-old girls will not give up until they figure out what is going on. And for all of you who remember being a kid in the 1980s, flashback time! Finally, The Unbeatable Squirrel Girl, Volume 4: I Kissed a Squirrel and I Liked It. As much as I love Squirrel Girl this volume was a bit all over the place. It starts off as a kind of choose your own adventure story except all the choices pretty much flow across the same pages and it just doesn’t work that well. From there we have a series of SG fighting random bad guys with the help of various friends. Then at last it settles in to an actual story with Doreen (Squirrel Girl) trying out the online dating scene. It does not go well. 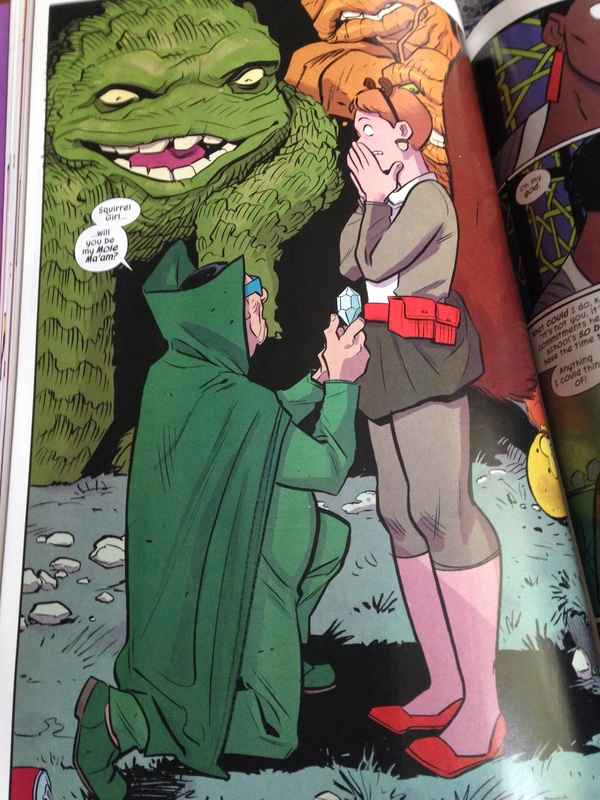 While out on a date Mole Man shows up and ends up falling in love with Squirrel Girl who has absolutely no interest in him and tells him so. But Mole Man will not take no for an answer and so pretty much holds the city hostage unless SG goes out on a date with him. Of course SG gets all sorts of pressure from people telling her to date Mole Man, where’s the harm in one date, maybe he’s not such a bad guy, blah blah blah. Ladies, you know the story. But SG stands up against the pressure and her friends all support her and in the end Mole Man backs down. SG even tells him his feelings are not her responsibility. The story deals with the issue pretty well without being too blatant about it but also not so subtle that it isn’t obvious that a point is being made. It’s not “a very special episode” but it verges in that direction. Not my favorite Squirrel Girl volume, but it still had some fun moments. Meanwhile I LOVED MONSTRESS SO MUCH. I am now caught up on all the issues that there are, and I’m sad because I have no more to read. The art is so gorgeous and the twists and turns the story has taken have been so twisty and turny. What will happen nexxxxxxt? I must know! Jenny, heh, yeah, it wasn’t preachy but it could have been. As you say though, a useful message for everyone. 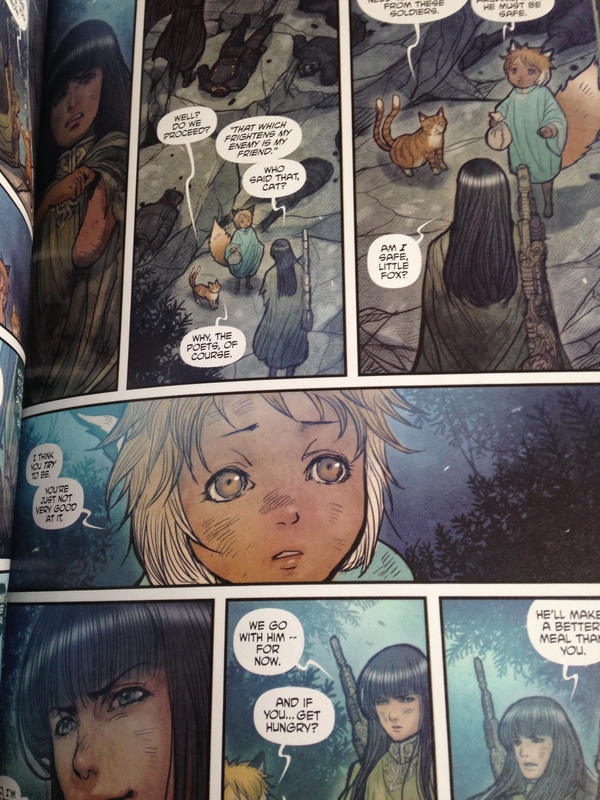 How have your read volume 2 of Monstress??? It hasn’t been published yet! The art is really beautiful and even in the first volume so many twists and turns. Sooo good! I’ve had many months like that too when I’ve got so many books going on but haven’t finished anything! Glad you got some books that were able to get you over that. These do sound like fun, in particular, Paper Girls. I need to see if my library has that one! Iliana, yeah, it’s nice to have a few short easy things to rip through to help a person feel better about finishing/not finishing something! paper Girls is a hoot! I hope your library has it! Yes, I know the feeling too, Stefanie. Unusually for me I have about 3 books on the go, but that could mean no reviews for a while and that makes me a bit anxious. Oh and I do love the word monstress. whisperinggums, only three books? Such a lightweight! 😉 As I edge ever closer to the end of a number of books there will likely be a flurry of finishes in the next week or two but just getting there seems like forever! And yes, isn’t monstress great? Autocorrect keeps trying to “fix” it! Haha, yes it tried to fix it when I typed it in too. You know you’re on a winner when that happens. Either that or you’re completely off your tree! I always feel on catch up with graphic novels although I have enjoyed Fun Home and V For Vendetta (after Brexit the semi fascist regime’s slogan England Prevails! seems rather too close to the bone) and Barefoot Gen.
Ian, there is so much good stuff out there these days it is impossible to keep up. There has been a real flowering of the genre. I still haven’t managed to get to V is for Vendetta but I will one of these days! buried, the middles get to be uncomfortable and demoralizing if they go on too long! I do know Garfunkel and Oates! I will have to check out their special sometime soon! I don;t watch them often but they are pretty funny.I hope you get the first volume of SG soon and I hope you enjoy it! I bought the first of the Paper Girls, too, and really must get back to my comic book reading. Somehow Saga just sort of got too much for me–it is weird and wild in a good way, but I think my mood is not much for weird and wild at the moment. 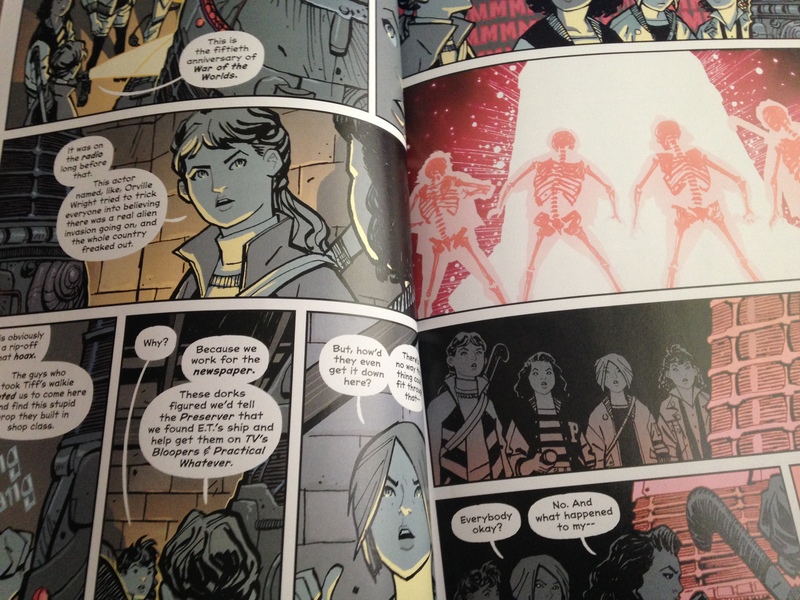 I need something more familiar perhaps–so Paper Girls might be just the thing since that is also when I was growing up–I would probably recognize lots about the setting and references. Hmm. Maybe I will pull it out tonight as a matter of fact….